english name "Smoky Slender Caesar"
The following is largely based on the original description (Wood 1997). The cap of Amanita pallidofumosa is up to 110 mm wide, pale smoky gray to pale gray brown, convex then flattened convex, sometimes depressed at the center, smooth, dry, thin-fleshed near the margin, with a striate margin. Some volval remains are present that are white, membranous, flat, and irregular. The gills are free to adnexed, crowded, thin, white to off-white, with a white edge. The stem is up to 125 × 13 mm, equal or slightly narrowing upward, smooth and white above, off-white and finely hairy below. The ring is membranous and persistent, skirt-like, striate on the upper surface, and white to grayish. The base is only slightly clavate, with a saccate, prominent volva, which is thick, membranous, and white. spores The spores measure 10.5 - 12.0 (-13.2) × 7.2 - 9.6 (-10.2) µm and are broadly ellipsoid to ellipsoid and inamyloid. Clamps are absent at bases of basidia. discussion Wood describes the mushroom as occurring in sclerophyll forests and "tall open forests" from the state of New South Wales and Queensland, Australia. A sclerophyll forest in the Australian bush is a forest of hard-leaved plants including Eucalyptus in the overstory (wikipedia). author A. E. Wood. 1997. Austral. Syst. Bot. 10: 751, fig. 14(a-e). 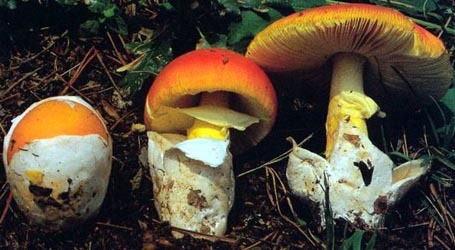 The following material is based entirely on the protolog of this species, which does not meet contemporary standards for Amanita taxonomy. 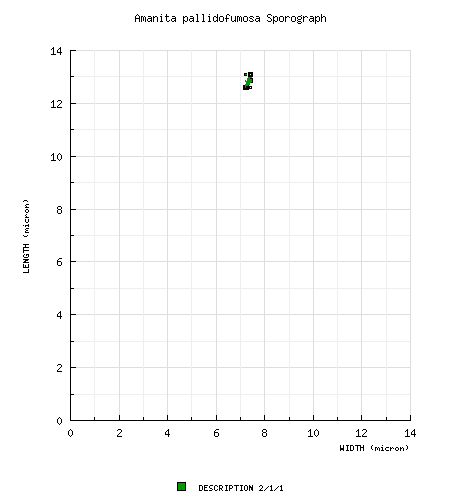 from spore drawings in protolog: [2/1/1] 12.6 - 13.1 × 7.2 - 7.4 μm, (Q = 1.74 - 1.75). ecology from protolog: In tall, open forest. material examined from protolog: AUSTRALIA: NEW SOUTH WALES—Woolgoolga, Conglomerate St. For., 21.iii.1983 J. J. Bruhl s.n. (holotype, UNSW 83/243B). select a collection to review/add spore measurements..#783909. J. J. Bruhl, #s.n., AUSTRALIA, NEW SOUTH WALES, Woolgoolga, Conglomerat..